New Zealand batsmen shown their intentions ahead of first Test to the Kangaroos as three of their master blasters scored centuries in the tour-match against Australia A. The match played at Allan Border Field, Brisbane, on November 24,25,26,27th, 2011, where Brendon McCullum thrashed 146 runs in the first innings of New Zealanders besides the match ended in a draw. That was followed by 138 by their Captain Ross Taylor and 175 by Jesse Ryder in second innings. Earlier New Zealanders scored 423 runs in their first innings, Doug Bracewell scored 73 runs as Taylor contributed 57 runs besides ton by McCullum. James Pattison was the pick of the bowlers fromAustraliaA who claimed four wickets, Mitchell Starc took three, Ben Hilfenhaus and Ben Cutting shared one wicket each. Australia A responded well by scoring 395 runs with a responsible innings of 145 runs by Ed Cowans well supported by fifties from the blades of David Warner and Matthew Wade. 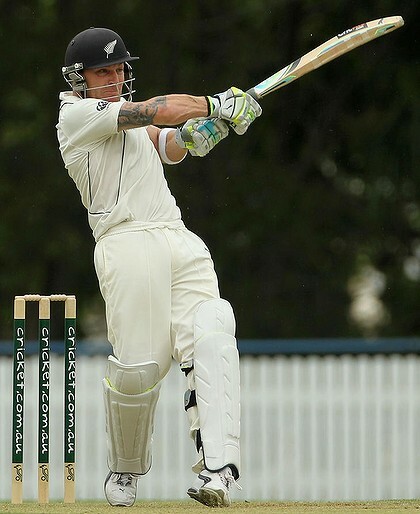 New Zealander attack was spearheaded by Bracewell who sent four batsmen back to the pavilion as Chris Martin, Trent Boult and Tim Southee shared two wickets each. The visitors had scored 75 runs for the loss of two wickets at stumps on third day and secured an overall lead of 103 runs. Martin Guptill was unbeaten on 37 runs whileTaylorwas at the crease on 14 runs. They opened the fourth day on a positive note by utilizing the batting opportunity but Guptill who could not carry on and lost his wicket after scoring 47 runs. The third wicket fell at 126 runs and the hard hitting Ryder appeared on scene and joined in withTaylorin the center. The duo dominated the proceedings and the home bowlers were at their mercy as they found it difficult to dislodge the partnership. Ryder was more aggressive of the two and punished the rival bowlers at his will all around the ground with his immaculate hitting. Australia A Captain George Bailey made changes in bowling every now and then while utilizing nine bowlers to separate the onslaught of the batsmen without any success and the proceedings looked one sided. They shared 160 runs for the fourth wicket before there was a sigh of relief for the hosts. Taylorlost his wicket after scoring 138 runs off 171 balls with the help of seven sixes and 11 fours. Dean Brownlie came in next to have a vital batting practice on the pitch which was providing lot of assistance to the batsmen. Ryder took charge by demolishing the rival attack and most of the boundaries scored by him were flying as compared to the rolling ones. The 27-year-old lost his wicket while he was going great guns at 175 runs off 137 balls which comprised 16 towering sixes and 11 fours. The New Zealanders posted 467 runs for the loss of six wickets as Brownlie remained unbeaten on 53 runs. Cutting was the top wicket taker for Australia A by taking two wickets, while Starc, Hilfenhaus, Michael Beer and Nic Maddison shared one wicket each. New Zealandteam will enter in the first Test againstAustraliawhich will take place atBrisbanefrom December 1, 2011.